10FastFingers is a online typing test website to test your typing speed, it’s free and easy to use. Just start typing the words on the web page, and one minute late, you will see how fast you type. 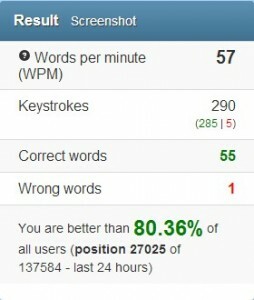 The result includes the WPM(words per minute), Keystrokes, Correct words and Wrong words.